There’s no doubt that a mudroom is a great addition to any of the Lakeville MN homes, especially for families with children and pets. 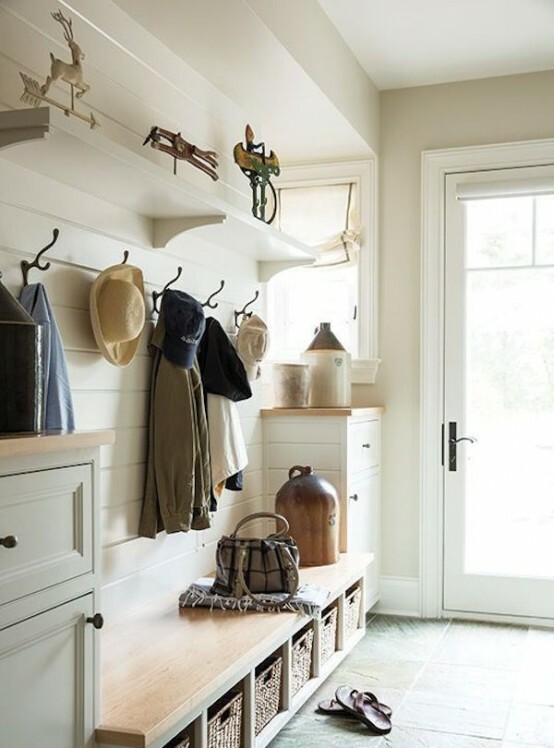 Rather than put unnecessary wear and tear on your front entrance, which probably has attractive wood floors or carpeting, a mudroom allows you to deal with dirt, mud, snow, and other wet and dry grime in a spot hidden away from guests’ eyes — and the rest of your lovely home! If you’re currently building a home with a mudroom, here are some tips for creating a space that will be easy to clean and keep organized. First and foremost, choose materials that can stand up to heavy traffic, water, mud and the worst that the outdoors can throw at it. Brick, stone, concrete, and tile are ideal for the flooring and maybe even for part of the walls for easier cleanup. Do aim for a textured floor surface, however, as shoes and feet may be wet and you don’t want to create a slippery situation. People often choose to connect their laundry room and their mudroom for convenience, but even if you have a separate laundry room, you may want to consider a laundry sink. It’s useful for washing down everything from dirty shoes to dirty pets if they fit! Even if you don’t add a sink, make sure you do include electrical outlets for chargers, vacuums and other items. To keep the space clean once it’s set up, make sure you include mats on both sides of the door, which will help prevent tracking in some of the mess. Look for mats that can be hosed down and/or thrown in the washing machine since they’ll be getting a lot of use. Consider creating a drip basin for boots and umbrellas. A plastic tray — people often like to add small stones for a more attractive look — help catch the runoff from wet shoes and similar items. You may also want to consider adding in plenty of hooks for wet coats and/or include a drying rack for hats, gloves, coats and other items of clothing. Many racks can be mounted on the wall to fold out when needed and fold up when not in use. A typical family of four and a dog ends up with a surprising amount of items that often end up in a mudroom. To keep things organized, install shelving or cubbyholes and make use of plastic storage bins that can be kept in the shelving. Properly labeled, they make it easier for everyone to have a space to drop their odds and ends when they first come inside. Sports equipment, school bags, hats and gloves, and even leashes and pet toys can all have a designated spot in the mudroom if they don’t belong elsewhere. If your mudroom is where all of your family comes in and out of the house, turn it into an organization center, with a calendar that keeps track of any appointments, meetings, and events. It’s also a good spot to include an inbox for mail so that nothing important gets lost in the shuffle when you first walk in the door. The important thing for the mudrooms in Lakeville MN homes is that they work for each individual family. Think about how you will use the mudroom and incorporate elements that will best benefit you and your family. Maybe you just need some coat and shoe racks and perhaps a bench, or you may need a full storage system, including hooks for keys and spare chargers for phones and tablets. Just remember to make your mudroom easy to clean so the mud and other mess doesn’t sneak its way into the rest of your beautiful home!